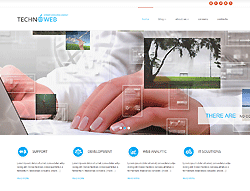 This theme contains a lot of elements and will help you reveal all the necessary features of your high-tech company. The spacious content area is improved with beautiful high-resolution photos that will visually put your customers on the right track. Social widget, responsive layouts and back-to-top button. The theme has everything to make the life of an average internet user comfortable on the virtual spaces. 006057 Responsive WordPress theme based on the Bootstrap 3 framework. The Bootstrap Framework makes it fully responsive to all screen resolutions and aspect ratios. Moreover, thus it carries a lot of useful features, for instance additional HTML elements, set of CSS components, grid system and much more.